The theme is how health IT community stakeholders can take advantage of collaboration opportunities with 11 key federal agencies. 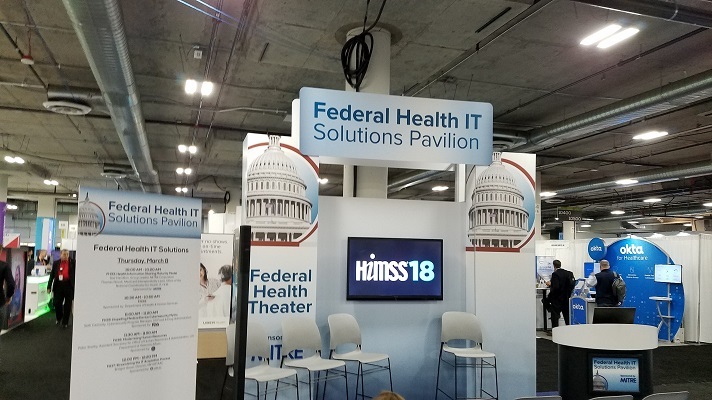 The Federal Health IT Pavilion at HIMSS19 is a place on the Exhibit Hall floor where attendees can interact with federal government agencies that have robust health IT portfolios. The theme of the specialty pavilion is collaboration opportunities – how health IT community stakeholders can take advantage of collaboration opportunities with key federal agencies. The goal is to show attendees is that the federal government is interested and engaged in promoting the health IT-related projects – and to showcase the funding opportunities available that stakeholders may want to explore. "Each agency will be highlighting its health IT portfolios, as well as possible ways to collaborate with them," said Jeffrey Coughlin, senior director, federal and state affairs, at HIMSS. "The pavilion is the only place at HIMSS19 where you will be able to visit with several federal agencies in one place and look for collaboration opportunities." The Federal Health IT Pavilion also features a theater where federal agency personnel and MITRE will be making 20-minute lightning presentations to interested audiences about their latest offerings as well as opportunities for partnership. "For example, the Department of Commerce will be discussing how its policies focused on expanding U.S. export opportunities increase jobs at home," Coughlin said. "The Defense Health Agency's presentation will highlight how cybersecurity standards drive health IT to transform the delivery of healthcare to service members, veterans and their families. Overall, through the deployment of MHS GENESIS, the Defense Health Agency raised the bar for cybersecurity and interoperability." "Each agency will be highlighting its health IT portfolios, as well as possible ways to collaborate with them." In addition, the Centers for Disease Control and Prevention will discuss modernizing guidelines and clinical decision support for the next stage of healthcare delivery, particularly how knowledge for public health action resides outside electronic health records and depends on human translation into system workflows, resulting in implementation variability and inefficiency, he added. "The CDC's presentation also will feature how standards and tools for describing knowledge now allow concurrent creation of human readable and machine-interpretable versions, providing the opportunity to modernize developing and disseminating knowledge artifacts efficiently at scale," he said. Coughlin said that attendees at the Federal Health IT Pavilion will have much to take back home. "The pavilion will help to break down any existing barriers between attendees and what the federal government is able to offer to the broader health IT community, in terms of new grant funding, informational training resources or guidance documents," he said. "I hope that the take-home message is that the federal government wants to engage with and help the community move expeditiously toward better cybersecurity defenses, expanded data exchange and improved value-based care delivery."